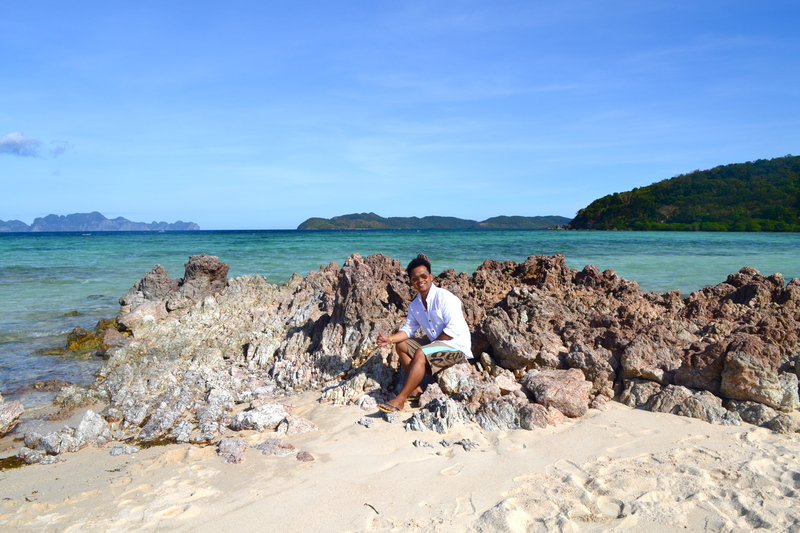 I was on my first journey to Palawan, dubbed as the Philippine’s Last Frontier. 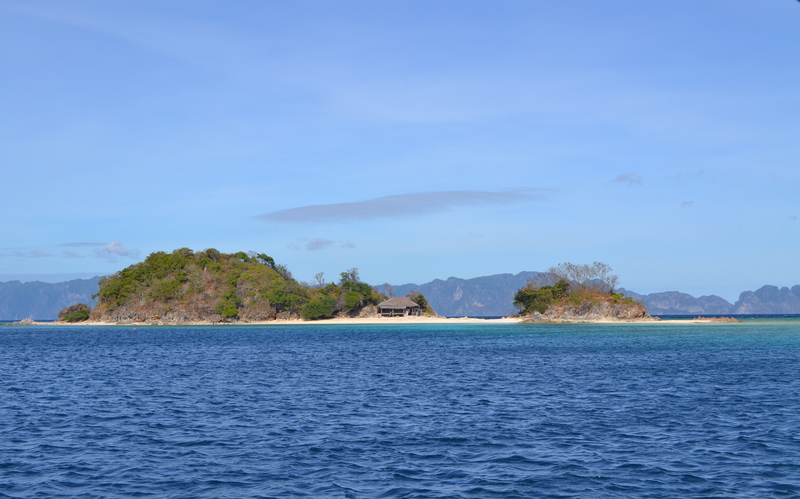 We spent our first day inland and our second day within stunning sites just within Coron Bay. 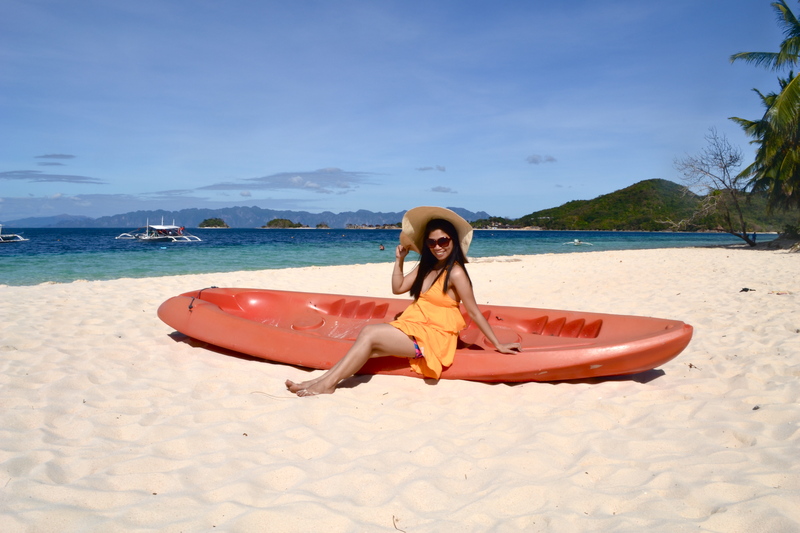 Click here for the details of our first two days in Coron. 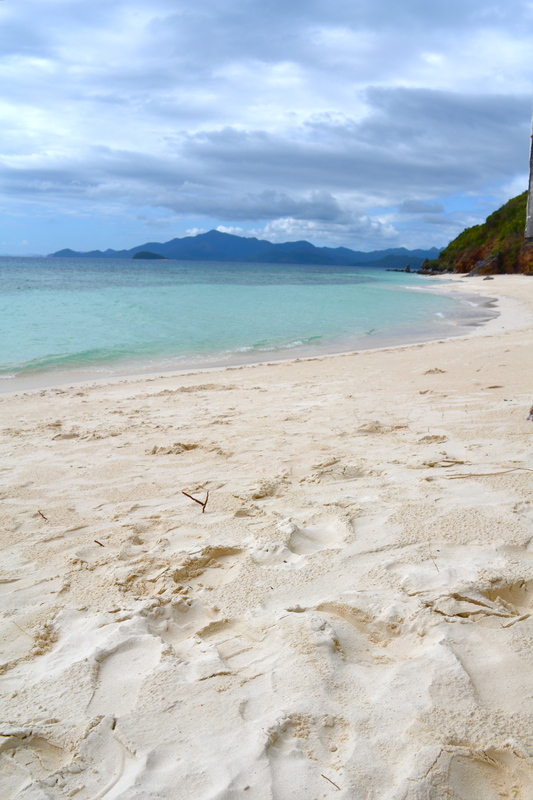 Our third day in Coron would be spent farther from the main island. Early in the morning right after breakfast we hopped into the same boat we used the previous day. It would be with the same tour guide and the same boatman. 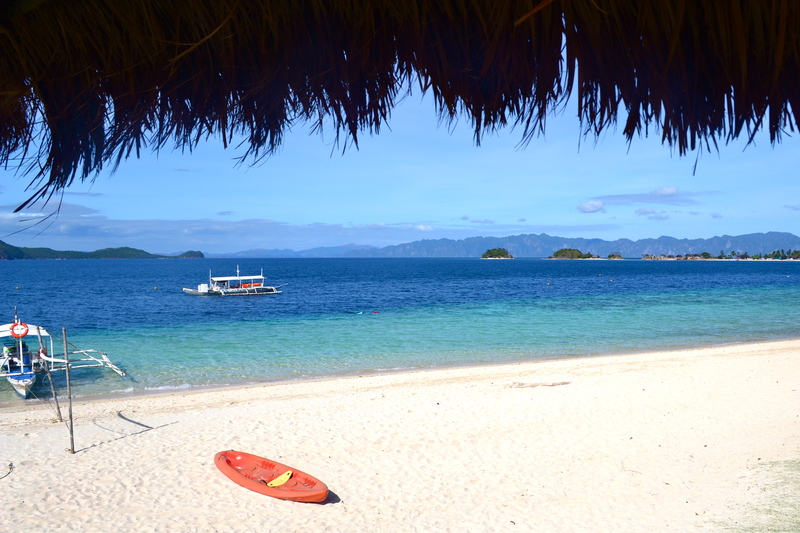 We had to leave early as we would be traveling for two hours to the outlying islands of Coron. It was quite the dreaded choppy seas that we got into the latter part of the trip that made my parents feeling uncomfortable. 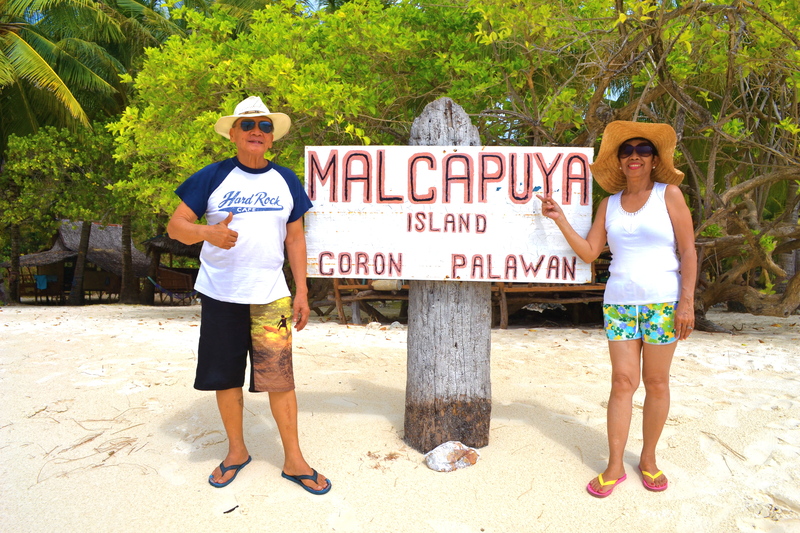 Thank God we arrived safely in our first island destination, the lovely Malcapuya Island. 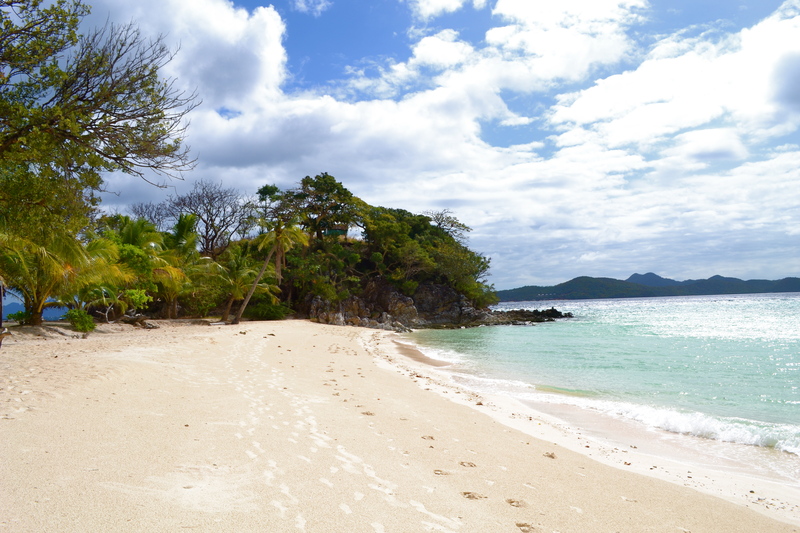 The island has probably the most beautiful and well-maintained beach that I have visited. No boats are currently allowed to dock on the main beach. Boats have to dock at the other side of the island from where the main beach is, just less than 3 minutes walk away. It is no wonder why the beach seemed to have maintained its beauty and and the waters, its translucence. The first thing I did was to dash madly to one end of the island and took this shot. Upon the rocks I carefully positioned my D-SLR to have a self-portrait not minding the blistering heat. I went back inland to join my family. The beach became our playground for a while. There were only a few visitors in the island at that time as it was so early. The beach has one of the finest, whitest sand I have ever seen. 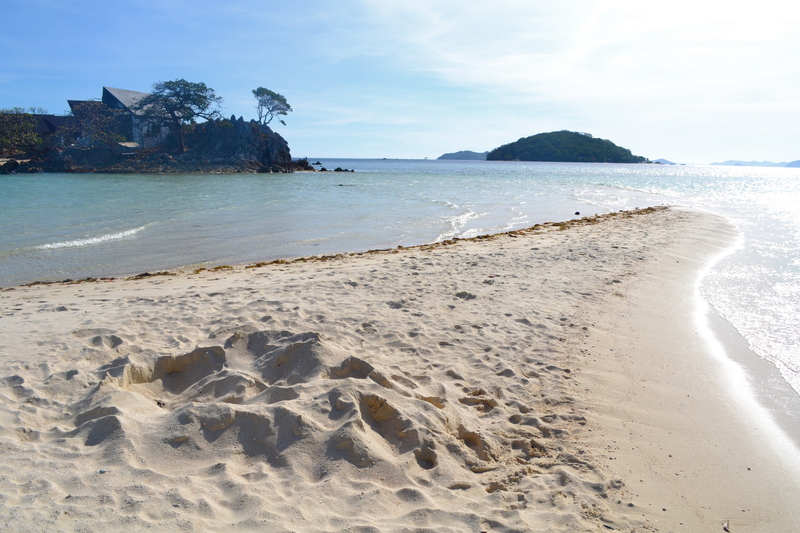 This is said to be comparable to the sand in the paradise island of Boracay in central Philippines and I could say, it is! Solitude is a reality here on a beach all to yourself. 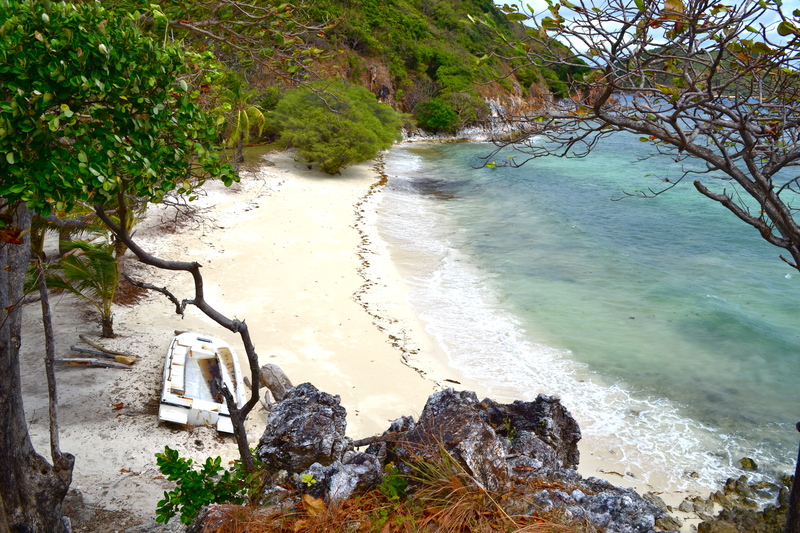 At one end of the island was the cliff that has an amazing view of the beach in Malcapuya island. As we ascended, the shorter alternative beach became visible. At the top, the view of the main beach looked stunning. The other side of the cliff was the equally stunning clear waters surrounding Malcapuya. Later, when we went down hordes of foreign and local visitors slowly filled the place. 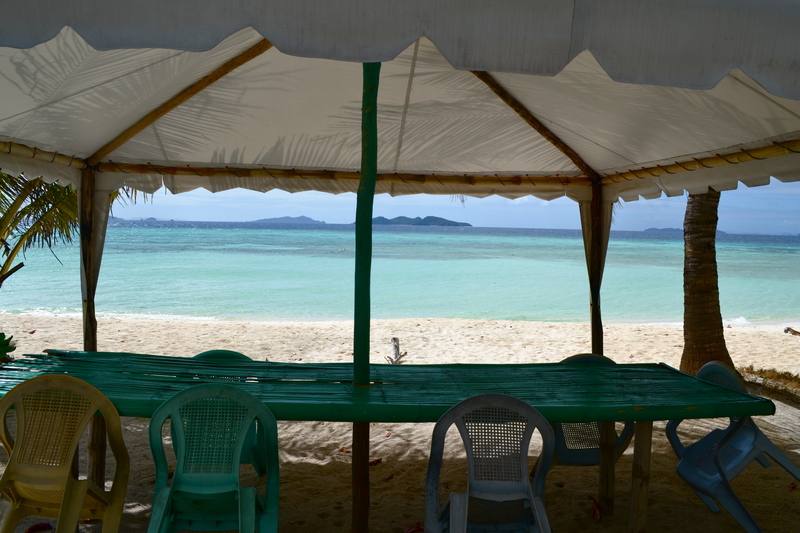 We positioned ourselves in one of the provided beach tents. 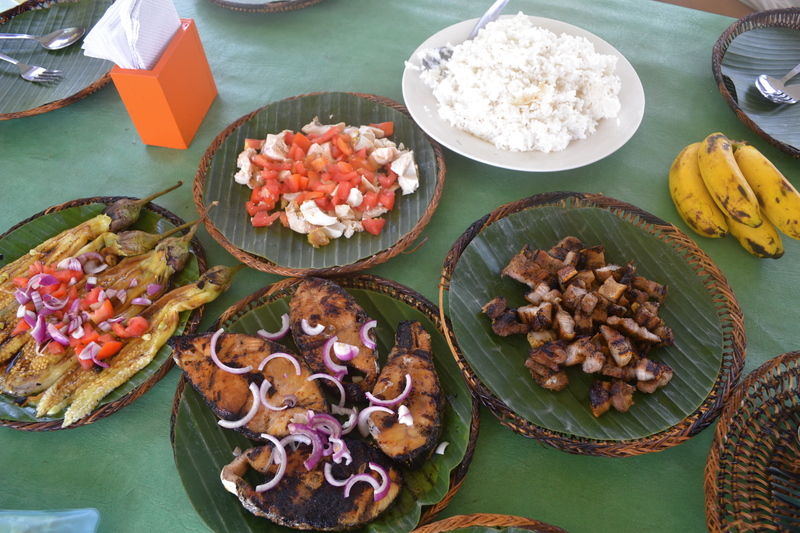 After dipping in the beach we were treated to a delectable Filipino food for lunch. After everyone was full, we prepared to leave the place for the other islands nearby. 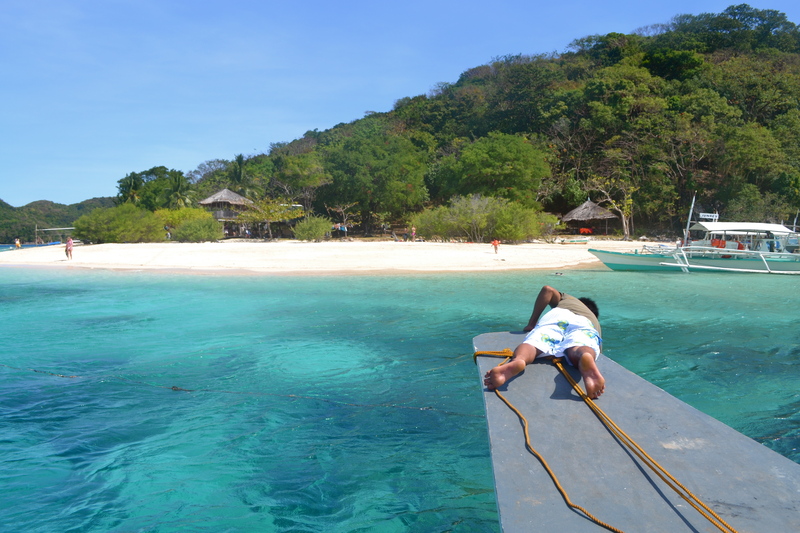 Just a mere 10 minutes boat ride away from Malcapuya Island is Banana Island. 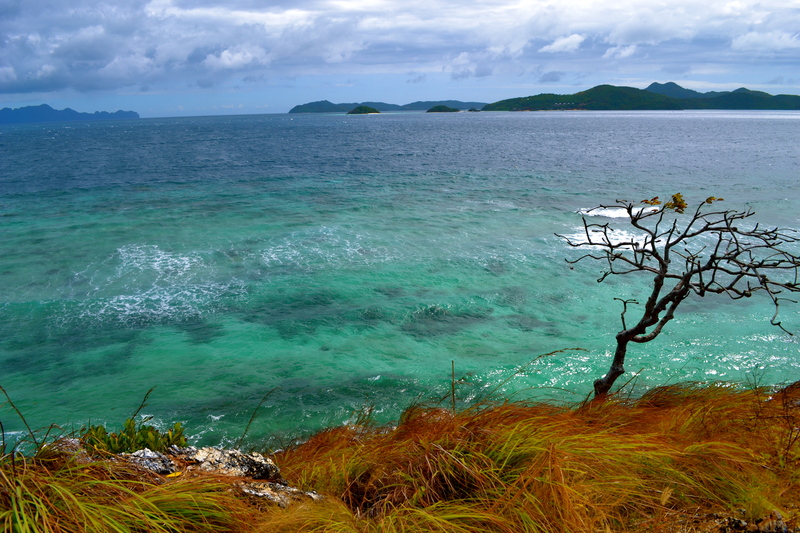 As we approached the island the turquoise waters caught my attention as usual. There was no other place where we could dock so the beach was parked at the beachfront, westside. 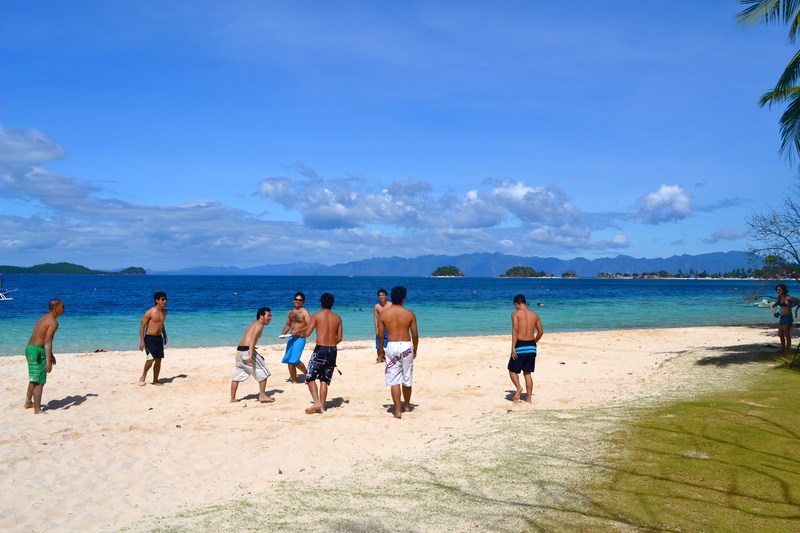 A group of local male tourists were playing frisbee when we arrived. 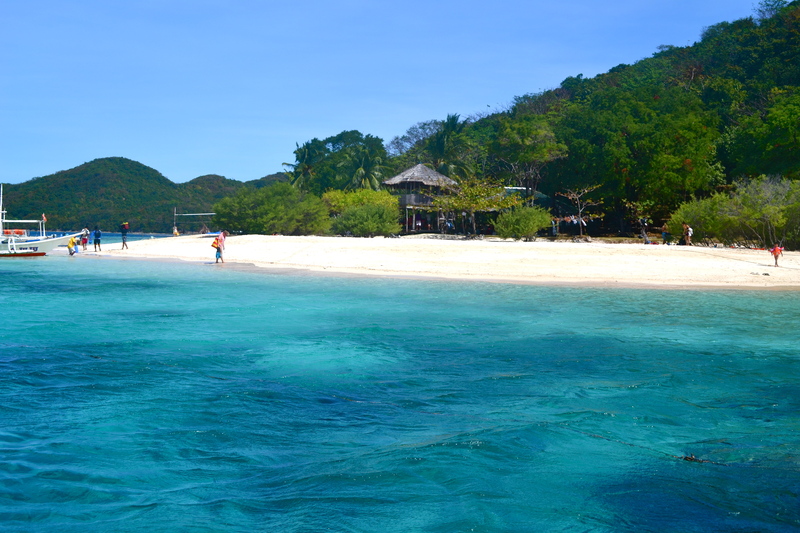 Malcupaya is indeed sexier but Banana Island has its own charm. 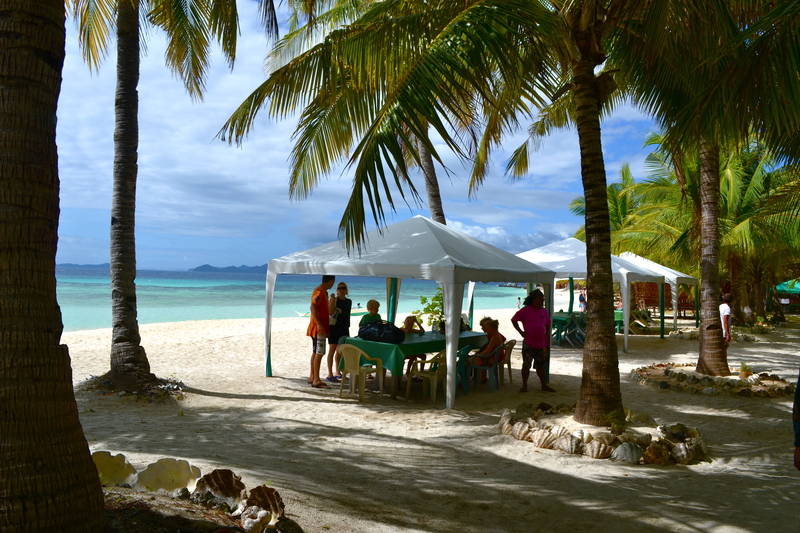 There were actually more people here in Banana than in Malcapuya probably because of the available resorts. The symbolic banana boat was on the beach. 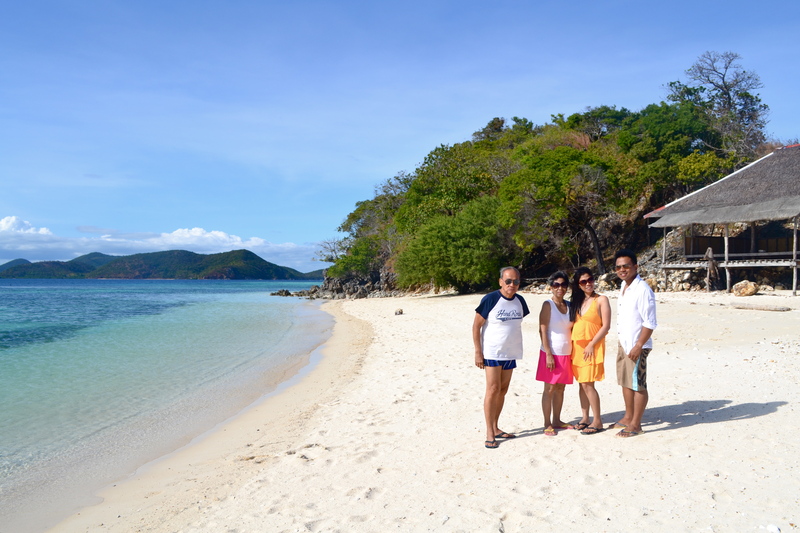 We toured the island, posed for some shots and rested for a while until we left for our last island stop. 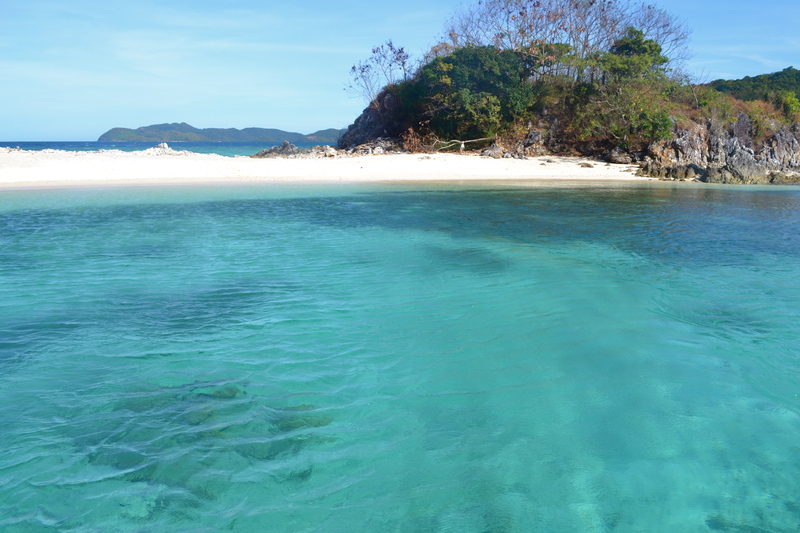 Just a few minutes away from Banana Island is the tiny Bulog Island. Up close Bulog Island was absolutely stunning. 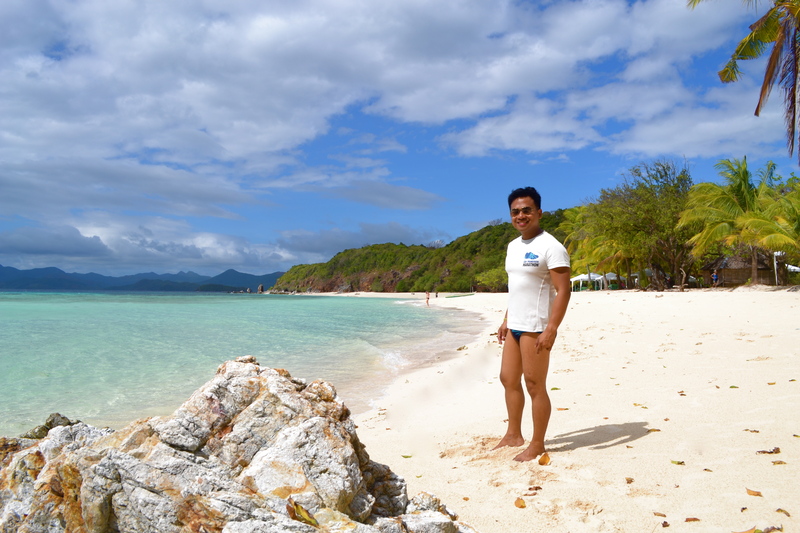 My jaw dropped seeing the amazingly clear waters backdropped by the contrasting white sand beach. With just a deserted huge hut nestled at the side of a hill, I was thinking this would be the perfect place for my wedding. Really! We were supposed to just pass by the island but I insisted to our tour guide that we alight for a few minutes and step on the island. 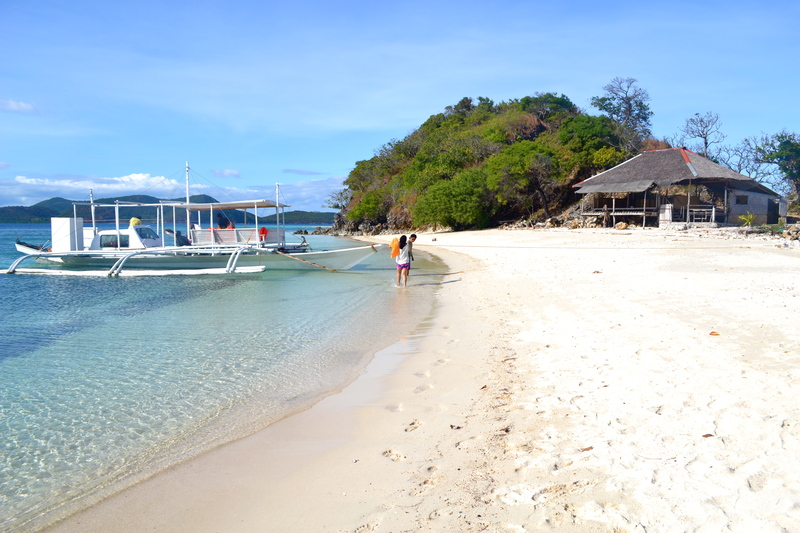 A sand bar actually connected Bulog to another island which is inhabited. 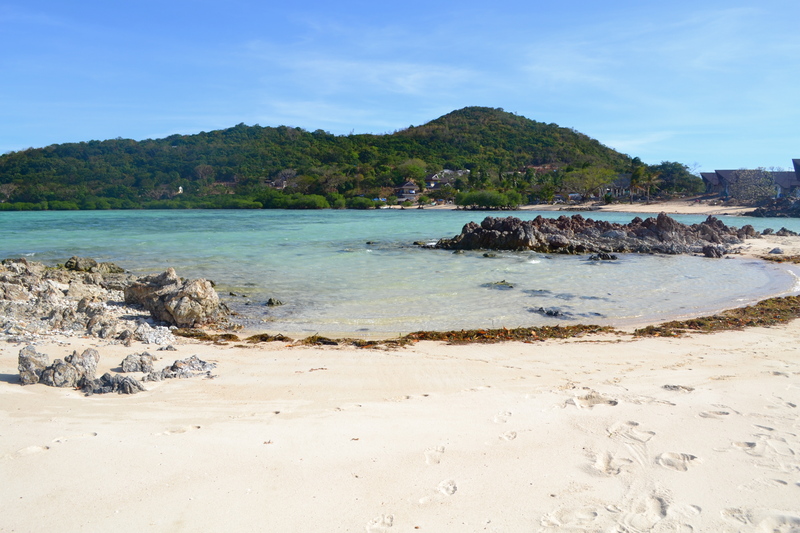 One could actually directly walk to the neighboring islands during low tide. On the rocks, I became the king of the island for a short while and then I gave up my crown when we left promising to be back with my wedding entourage! 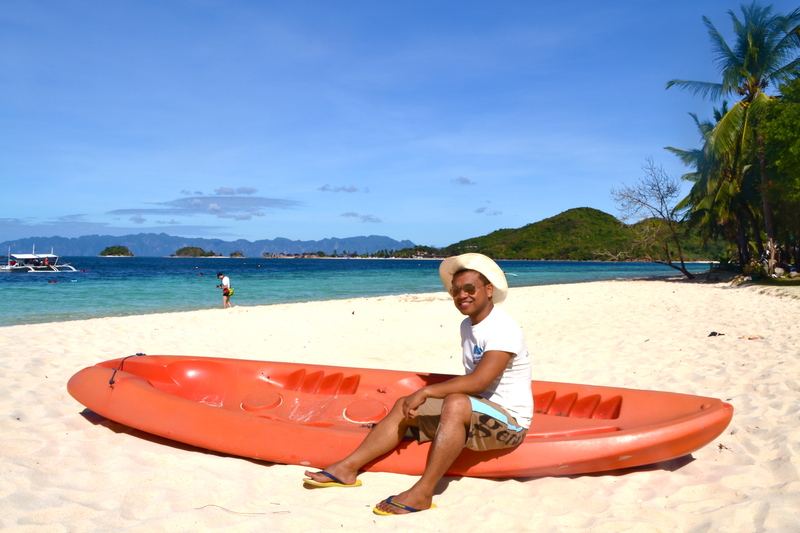 Indeed the outlying islands of Coron blew me away. 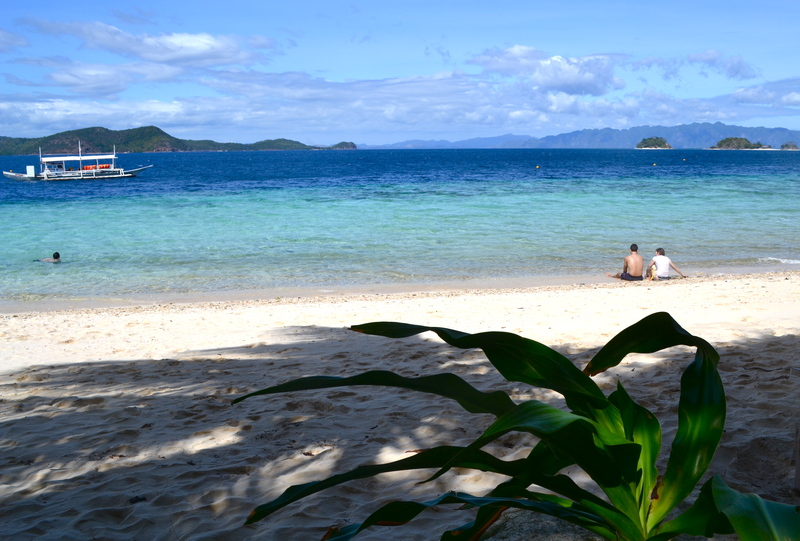 We missed some islands but our time was apportioned to only the best: Malcapuya, Banana and Bulog. MBB! Wow! 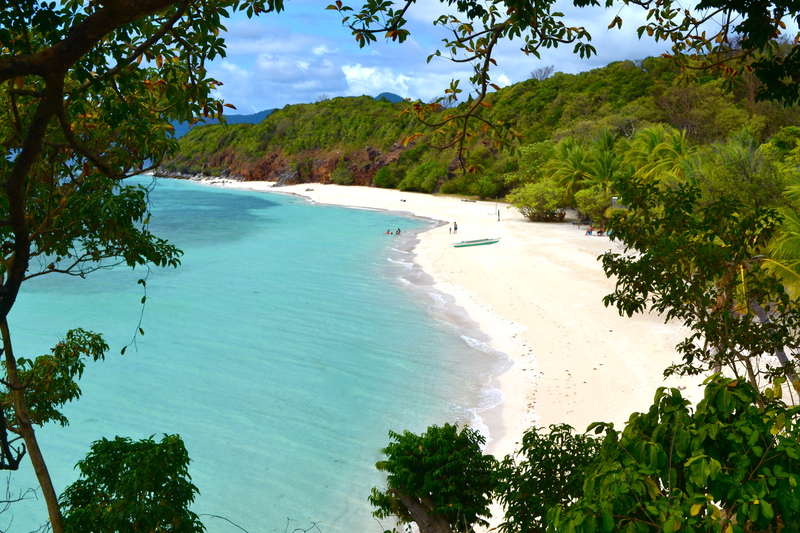 I want to go to the Philippines really badly now. Looks amazing! Thanks for sharing your story and photographs. Glad you had a good time. Keep traveling! Thanks for visiting my site. 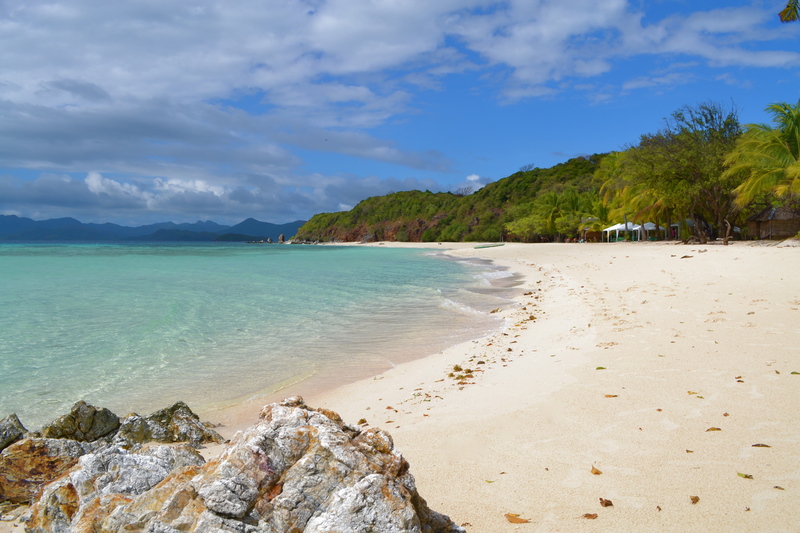 Yes, the Philippines is such a beautiful country, underrated that is. Please do come and enjoy. You can always contact me if you need advise or help. Thank you again! God bless you! Amazing Erwin. My next trip to Philippines I will make sure to visit this place. Thanks for sharing the beauty of the Philippines. huh! Glad you have discovered this fantastic places. Thank you. 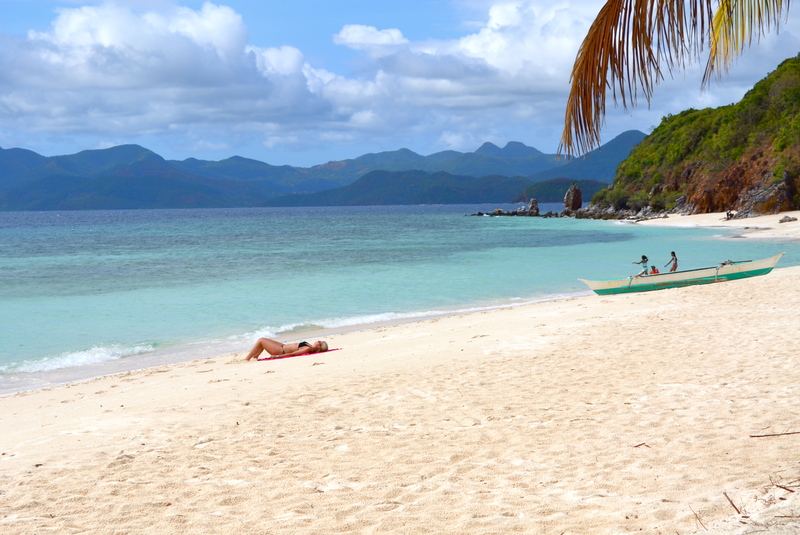 I will surely visit this on my next visit to the Philippines..
« Philippines: Stunning Coron, Palawan!